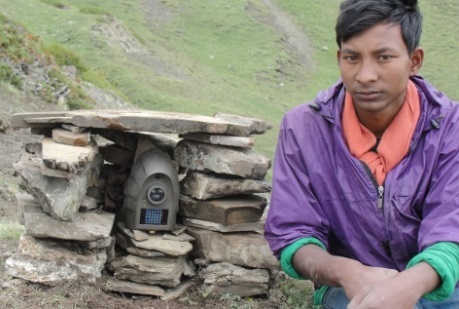 As recently as a few years ago, Ramesh Sunar of Thini, Annapurna- Nepal, used to kill Chukar (partridges) and other wild birds without a second thought. Whenever he caught a glimpse of a fox, he would chase after it. But ever since he became a Snow Leopard Scout, his attitude toward wild animals has transformed radically. He no longer harasses any wildlife be it a fox or a bird or a vole, rather he observes it with curiosity. After being a Scout the past few years, Ramesh now teaches his fellow junior Scouts how to set up and operate remote trail cameras. Having travelled to altitudes as high as 4700 m, he knows where and when naurs (blue sheep) and musk deer may graze along the high alpine slopes. “I can track snow leopard pugmarks, collect feces, sniff out urine scents, and locate scrapes,” Ramesh remarks, describing some of the responsibilities he has to perform as a member of the Scouts. Snow Leopard Conservancy — in partnership with Annapurna Conservation Area Project, the largest undertaking of National Trust for Nature Conservation — conducts a Snow Leopard Conservation Environment Camp every year in three different regions of Annapurna. 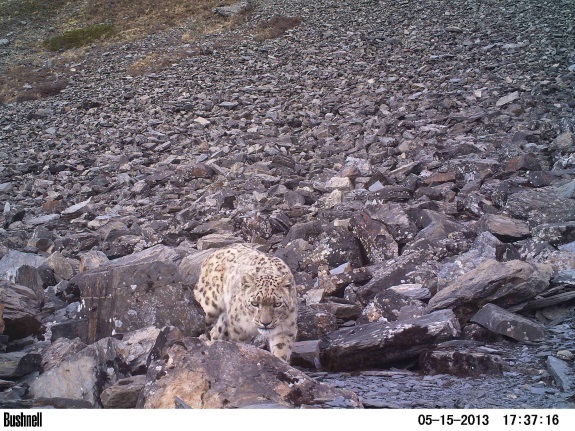 During each of these camps, at least eleven students along with few local teachers and rangers are trained on snow leopard tracking techniques, blue sheep observation and data collection skills. Even before he joined the Scouts, Ramesh often helped his father, a cattle herder, at work. He vividly recounts an incident when he was in 7th grade. “We had 24 goats, three jhoppas (yak-cow cross), and two cows.” His father being a communal herder however, was responsible for herding around 200 goats from 25 houses. His father had gone to Jomsom (district-headquarter) for six days and left Ramesh behind with all the animals. All of a sudden, a snow leopard jumped on the flock of goats from a Dhupi (Juniper) bush. Ramesh screamed at the top of his lungs, but to no avail. The creature had managed to carry away a goat belonging to one of his relatives. “My father returned and took the goat’s horns back to show the owner that his animal was killed by a snow leopard,” he recounts. “He did not have to pay any money, but he yelled at me for not looking after the goats properly.” Fighting back tears, he remembers how furious he was with the snow leopard. To date, Ramesh has made eight excursions to set up remote cameras in the high pasturelands and ridgelines where the snow leopards live. “Twice there were no snow leopards, but we succeeded the other six times,” he boasts, grinning with satisfaction. The remote-cameras have also managed to capture blue sheep, yaks, foxes, and pheasants. “It’s an amazing experience,” he declares.